From a ranch in northern Texas where the Bluebonnets bloom beyond the horizon there came news from a good online friend that she had lost two of her best friends, Sally San and Finale. I will let her explain who they are and why they were so special. Lynn Baber writes from the heart in a style that makes one feel like you are sitting across from her on the front porch and listening to her speak, a technique I still haven’t mastered after all these years. Her new book Amazing Grays – Amazing Grace is written in this “conversational” manner. Be sure to take a look at her new book when on her website. I try to keep my blogs light, entertaining and educational. Sometimes I am reminded that there is more to life than just those things. This is one of those times. This is the heartwarming and inspirational story of the passing of special friends. Days like today occur in the lives of most horse owners sooner or later. 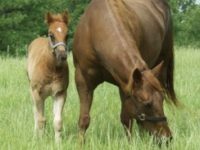 The vet arrives, and when their truck pulls out to leave, your equine family has lost a beloved member. Today we lost two; our 30-year old mare Sally and her pasture-mate Finale, the last donkey we raised. Sally earned two Register of Merit awards in AQHA competition in Reining and Roping. Sally produced many gorgeous foals for us over the years. But what we will remember most is not her accomplishments in either the show pen or foaling barn, but her service to those she lived with. Any newly weaned foal that needed maternal security could count on Sally, even if it meant sharing the milk supply with the foal at her side. We’ve had to wean a foal first from its own mother and then again from Sally. No other horse is my experience lived such a peaceful life as did Sally. She never once offered to put a hair or hoof out of line. She never fought others for food or status. She was an easy keeper and an easy breeder. Sally made it past one appointment with the vet over two and a half years ago. After having her teeth done she lost hundreds of pounds and was scheduled to take her final trailer ride the next day. Sally never offered an opinion or much overt personality. She was just as calm and steady as they come – until the morning of the appointment. That morning she met us at breakfast time, whinnied for her food, and gave every indication she had decided to actively participate in life. And she did. Finale already shared a pasture with Sally when we had to turn out Sky, my most beloved horse of all time, due to blindness. Sky went to live with Sally during the period when she was losing so much weight. Somehow it made sense to me since Sky had sired Sally’s best foals. Perhaps she knew she had to care for one more charge. Sally gave Sky security and served as his seeing-eye pony until he was no longer able to find water and food. Even though he was sound, strong, and otherwise healthy – we knew that he could not survive without Sally. Surprisingly, he went first. Over the past year or so we wondered what we would do with Finale when we lost Sally. Finale was only four years old, but had suffered from multiple lameness issues his entire life. We had been aggressively working on him for the past year and thought we were doing really well. His gait quality was nothing to write home about, but just a few weeks ago Finale was trotting and running in the pasture. We hadn’t seen that for a long, long time. Finale went swiftly downhill over the past two weeks until he could do nothing more than lie flat on the ground. Bute and Banamine didn’t help much and it became clear that a call to the vet was necessary. Did Sally really know her work was complete, her service finally ended? Did Finale know Sally was nearing her end? I don’t know, but they left the pasture together, and are together still. In the case of Miss Sally San I will choose not to say good-bye, but instead to say thank-you to a mare who cared for all who needed it. And, I will miss hugging Finale’s magnificent ears and adorable fuzzy face. Sally, thank you, and tell Sky hello until I get there, too. Thank you so much Lynn for sharing with us. A tribute like this means that a couple very special friends from a ranch in northern Texas gave everything they had and more in appreciation of the love shown to them by their human friends. What more can we ask of our special animal friends.